~ Living life to the fullest and without regret no matter how hard things may become. 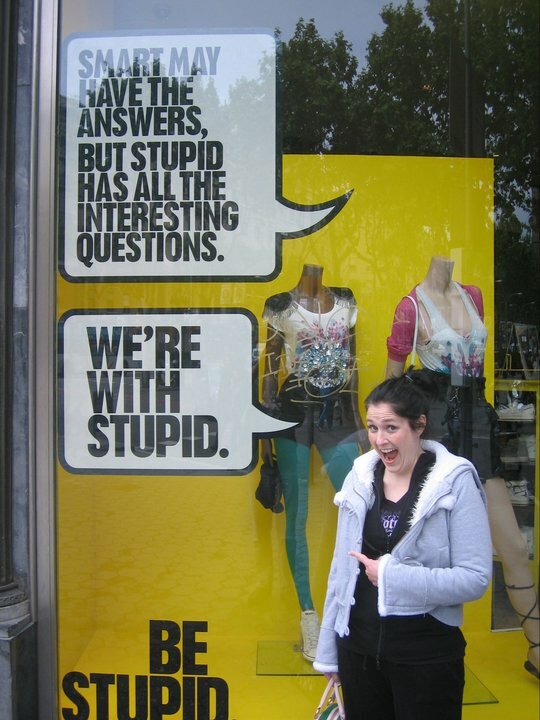 This is me standing in front of a clothing store in the middle of Barcelona, Spain. I was here in April 2010 while on my honeymoon. While cruising around the shopping area, enjoying tapas, cafe scenes, and shopping, I happened upon this awesome window display. To be honest, I have no idea what clothing store this was for. I just know that it had a lasting impression on me because of how incredibly forward and fun it was all at the same time. Me enjoying an awesome window display in Barcelona, Spain. I do love a Barcelona window. They were great for window shopping, that’s for sure. Though, this one was the most bizarre. There's not a whole lot to tell about me that anyone really cares to hear, I'm sure. I'm a 36 year old disabled, disgruntled, and slightly drunk young woman lost in a world full of depressingly dull people. I'm happily married. I'm constantly in search for cures for my many debilitating health issues. I'd like to live past my 40th birthday if my health allows it. I'm a huge geek. I think I'm terribly witty and funny. That's probably wrong, but I honestly do not care. Just waiting for the day the TARDIS shows up to take me on my own adventures. Want to be blog buddies?